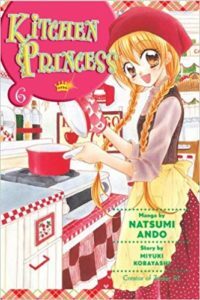 Last year my seven year old got into a cute cooking manga called Kitchen Princess. I read and reviewed book one for Cannonball Read 10 but then only skimmed through the second through fourth books. After reading volumes five and six my daughter somberly told me that a character had died and requested that I read them too. This was an unexpected turn for a shojo manga. 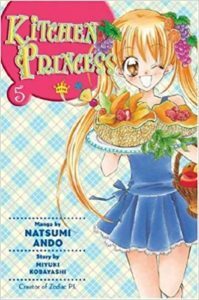 The first four volumes contained a beginning love triangle between female protagonist Najika Kazami and brothers Daichi and Sora Kitazawa, friendship, mean girl rivalry, family turmoil, competitions, and lots of cooking and baking. Najika is a bit dense and has not figured out that Daichi likes her. Daichi is conflicted about his feelings for Najika as he knows that Najika cares for his older brother, Sora. Sora clearly has feelings for Najika but we learn in volume five that there also have been ulterior motives behind his attention. Volume five begins with Najika puzzling why Daichi kissed her upon winning the first round of the National Western Confectionery Competition. When Najika asks Daichi why he kissed her since they were “just friends”, Daichi takes it very badly and lashes out saying it didn’t mean anything. Najika is destroyed that her first kiss, something that should be special “didn’t mean anything”. Najika descends into a deep funk effecting her ability to prepare for round two of the competition. Daichi is horrified that his actions have hurt Najika so badly. He turns to his older brother, begging him to cheer up Najika, a task Sora gladly takes on. In preparations for the second round Najika overuses her wrist causing tendinitis, during the competition she drops a mixing bowl as a result. Daichi rushes to her aid and wraps her wrist using injury treatments he learned in basketball. Upon winning the second round it is revealed by the brothers’ father that Najika is the daughter of famous pastry chefs, the sole survivor of the terrible accident that took her parents’ lives. This brings unwanted attention Najika’s way. She goes to ask Sora to please stop the articles but instead overhear’s Sora and his father, the director of the academy, discussing using Najika’s fame to further the prestige of the school. The director informs Sora that if Najika doesn’t win she will be expelled from the academy. Najika is crushed to learn that Sora had been giving attention to her under instructions from his father. Sora explains and apologizes that at first it was due to his father but then he came to like Najika for who she is. Najika accepts the apology and the two begin getting ready for the final round. Her dessert requires vanilla so in a touching gesture, right before the competition is about to start, Sora goes to a specialty shop to get whole vanilla beans. Wrapped up in thoughts of Najika, Sora accidentally walks into traffic and is hit by a truck. The last panel shows the side of Sora’s head with blood trickling down and an oxygen mask on. The sixth volume begins with Sora begging Najika to go to the competition, to win and live her dream of becoming the world’s best pastry chef. He also reveals that he lied to her about being her “Flan Prince”. Sobbing, Najika begs to know why he would lie. Sora explains it was because he wanted to be her Flan Prince and then he tragically dies. This shock causes Najika to lose her sense of taste and also the competition. Daichi insists to her that they will get through this together. He even makes a deal with his loathed father for Najika to be able to stay at the academy. Daichi swallows his pride, consenting to everything his father asks, and rushes to tell Najika, only to find her gone. He intuits that she would go to her birth town and finds her, convincing her to come back to the academy. When it gets out that Sora was killed doing something to help Najika, the mean girls accuse her of causing the popular Sora’s death and make her even more miserable. Daichi admits to a friend that he has come to realize how much he cares about Najika but he doesn’t want to intrude on her memories of Sora. The director informs his son that since Najika did not live up to the his’s expectations, a new brilliant cooking student has been recruited to the academy. The volume ends with it being revealed that the new student is a jerk, and in a surprise twist, looks identical to Sora. Wow, I can see why this was a lot for my seven year old to process. The books are rated 13+ but from what I had seen in the first four books I deemed the content appropriate for her to read. And honestly I was quite proud of my first grader reading material written for a middle grade and older audience. The cute cooking manga has definitely taken a more depressing turn. Despite the new somber tone my daughter still wants to continue the series but perhaps I will begin reading the books before she does from here on out. Share the post "In which the cute cooking manga takes a depressing turn"